If you haven’t already heard, there’s something going on in Fulton Market. While once a quiet, meatpacking-centric area just over a decade ago, this neighborhood is in the process of shedding that identity for a radically new look. This sub-area of equally trendy West Loop is booming with cranes, as everyone from tech giants to residential rental developers is hoping to snap up a piece of this up-and-coming neighborhood. While already able to boast such Chicago cultural landmarks as the Girl and the Goat, Au Cheval, Beatrix, and the Chicago French Market, much, much more is coming to Fulton Market just over the horizon. Beyond these longtime landmarks of the area, in just recent months Fulton Market has added an array of restaurant and leisure attractions. Lettuce Entertain You Enterprises, Chicago’s largest restaurant company, has been stirring up much of this change – bringing tastes of Japan with a second location of Ramen-San in May. In less than the past two weeks, the company has also sailed in from Greek shores with Mediterranean-inspired rooftop restaurant and bar Aba. The restaurant comes courtesy of Top Chef-featured C.J. Jacobson, with superstar Chicago bartender Liz Pearce, who you may know from The Drifter, to top it off. Instructions are as follows: walk in for the slow-braised lamb legs, stumble out after a spiced manhattan or two. Corporate giants too have recognized the rise of Fulton Market, with both Google and McDonalds deciding to locate their Midwest headquarters in the neighborhood this past year, and now Dyson following close behind. Google opened their Midwest headquarters in the area in 2015 and shows no sign of slowing down their bet on Fulton Market – announcing at the beginning of this month its plans to add on another 100,000 square footage. With the grand-opening of the McDonalds headquarters on June 4th, the area also gained 2,000 jobs and a 500,000-square foot development with public space, parking, and retail included. Even the Indonesian consulate has gotten in on the action! It paid in the range of $9 million to move to the area from their Wacker location. As for the future, Fulton Market residents can look forward to booms in rental property construction that will provide an influx of new tenants to enjoy the neighborhood’s increasing amenities and job opportunities alongside them. Among these developments includes 166 N. Aberdeen, which will bring over 200 rental units, and ground-floor retail, in addition to stunning glass architecture to a site within two blocks of public transit. Another proposed 36-story condo tower at 170 N. Peoria will only add more living options to Fulton Market, and inches its own way toward full approval. These quickly incoming rental options join existing properties such as Emme Chicago and Echelon, which includes a rooftop pool complete with cabanas, and newly renovated fitness center, along with other must-have elements of luxury living. 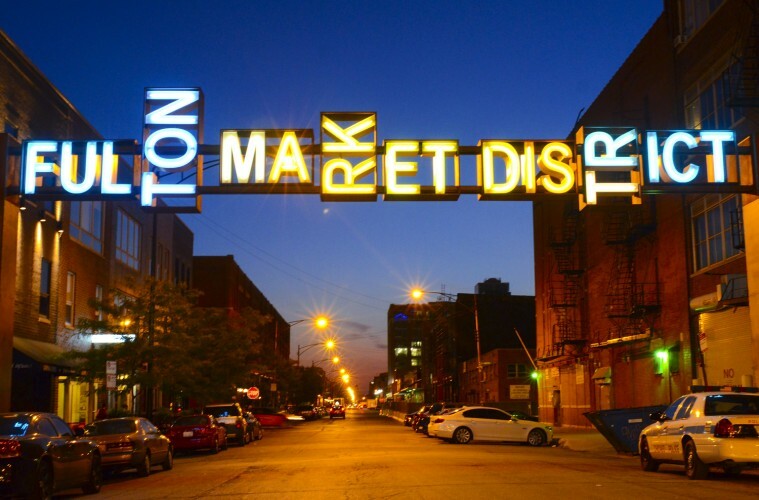 If not already on your list, these recent years and plans for the future demonstrate why Fulton Market should be on the radar for your next move! Fulton Market is in our backyard, so the agents here at Pearson Realty Group have quickly established themselves as local experts. If you’d like to become better acquainted with the neighborhood, you’ve come to the right place.